Most of us I’m sure must have often heard the voice on the London Underground warning us to “mind the gap” as we get off and on the train. As far as I’m aware nobody has ever been killed or badly injured by not minding these gaps but as I watched the videos of the interviews with scientists who were present at COP 21, I became aware of the much more dangerous gap that we had on our hands as we struggle with the CO2 problem. As always, the scientists were a bit cautious, but their message was very clear, about 98% of the scientists who are directly involved in climate research agree that if we carry on as we are doing, this century could well be our last one. On the flip side, we have the ordinary citizens, and there we have about 98% of them who are either outright deniers or who just couldn’t care less. If we are to win this battle (fight for life?) before it’s too late, we have to start closing this enormous gap by harnessing the power of the media and getting more and more ordinary people knowledgeable and involved. Quite rightly the media has frequently highlighted the dangers to our children’s health from the amount of sugar in fizzy drinks and confectionary. All very important, but let me put it to all these nice responsible Mums and Dads who believe and act on these warnings. The danger to your children’s health from too much sugar is minimal compared to the dangers to their health and life if we don’t get the CO2 levels down and get the earth’s energy balance back under control. Too much CO2 and too much sugar can both damage our health and both can kill us, the first from over-production and the second from over-consumption. First let me tell the Guardian of another milestone that we have just passed as we all Sleepwalk down the Road to Armageddon. 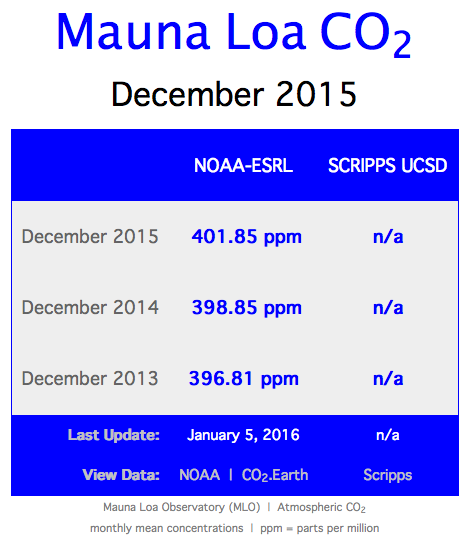 December 2015 was the first month since records began (March 1958) that the average December CO2 level in that year went up by 3 ppm more than the December figure for the previous year 2014. This is not a criticism of the Guardian’s extensive and excellent reporting of the sugar problem, but if we get our priorities right, then the reporting of the recent milestone, which I believe falls in the category “Threat to Earth” should get the ‘front and centre’ page treatment which the Guardian said it would get. As a bonus, the newspaper could also display on the front page the little Atmospheric CO2 widget shown on this blog, accurately calculated by co2.earth and updated every month. One final bit of information and comment. In December 1958 the CO2 level was 314.67 ppm and in December 1959 it was 315.58 ppm, an annual increase of only 0.91 ppm. Over the next 56 years the annual difference has increased exponentially to the present day 3 ppm and is still increasing in the same way. If we continue in this same business as usual way for the rest of the present century, please believe me when I say that eating too much sugar will certainly be the least of our grandchildren and future generations problems. By way of explanation in case you think that Hawaii is just a place you go to top up your tan, let me tell you, the Island has a mountain called Mauna Loa which is more than 4,000 m high. At about the 3,300 m level there is an observatory which is part of the National Oceanic and Atmospheric Administration (NOAA)-Earth System Research laboratory (ESRL)-Global Monitoring Division-(GMD).